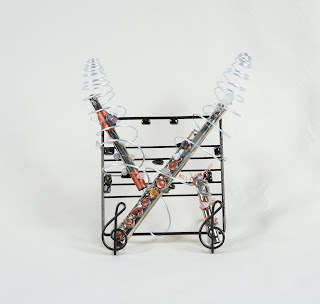 Thirty-eight South Carolina artists,including Vista Studio artists Sharon Licata and Michel McNinch, have each transformed a musical instrument into a piece of art. Creations (violins, violas, cello and flute) are on display throughout the Vista from March 1 to April 1. 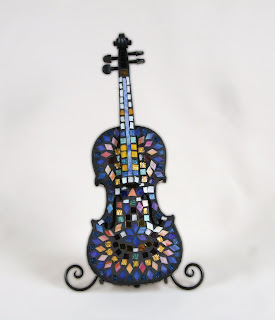 Many different colors of stained glass cover the violin and have been grouted in black to increase the drama in the piece. Light refracts over iridescent glass and “plays” with the viewer. Both the front and the back of the violin comprise the design. The magick that Mozart envisioned many years ago is still alive today — frequently in ways that we don’t recognize. This is the only flute in the collection. The public is invited to view the entire collection, meet the artists and begin bidding at a reception on April 3, 2008, from 6:30 to 8:30 p.m. at City Art, 1224 Lincoln Street. Ten percent of any City Art works sold the night of the reception also benefit the South Carolina Philharmonic. On April 5, the violins are displayed at the Koger Center and auctioned at this final Master Series concert of the season. All violins are available to purchase by bid, minimum bid $300. Bidding begins at the April 3 City Art show and concludes at at the April 5 Master Series concert. Limited edition posters of each artwork are also available for bid at both events; minimum poster bid $20. For additional information, call Robin Georgion at 803.771.7937.